It’s hard to say why, but the North London Derby is more dramatic than similar rivalries across the UK. Liverpool vs Manchester United are still fighting over trade disputes from the late 19th century. The Old Firm is rooted in sectarian conflicts between Catholics and Protestants. The antipathy that drives the NLD is simpler, more pure. It draws on the sublime joys of absolutely despising your neighbor. Which means that when there’s something on the line in a North London Derby— say, league table position or moving on in the Cup— the tension just gets ratcheted up astronomically. For several years, it wasn’t enough for Arsenal fans that their side qualified for the Champions League; they had to make sure Spurs didn’t qualify. Some fans would even accept relegation so long as they still finished above their rivals. Playing for honors and playing for spite aren’t mutually exclusive, but you’d be surprised how many fans on either side would pick spite if they had to choose one. 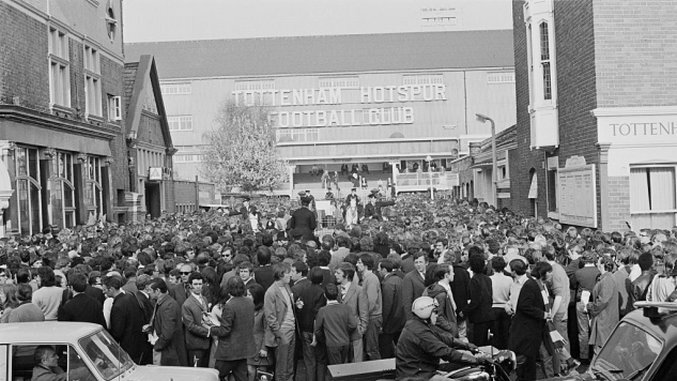 This week, we look back one of the most high-stakes editions of the North London Derby ever held— the title-deciding match at the end of the 1970-71 season. This was the setup: Arsenal went into their last match of the 1970-71 First Division season one point behind league leaders Leeds United. If they secured a win or a goalless draw, they would win the title. The twist: that last game was away at Tottenham. Spurs headed into the game in third place, but far enough behind Arsenal and Leeds on points that they were out of the title picture by that point. They had all but secured a spot in the UEFA Cup the next season, anyway. That night was all about playing spoiler. Arsenal simply could not be allowed to celebrate a league title on their patch. But the evening didn’t quite go their way. They managed to hold Arsenal off for most of the game, but if their motivation was spite then things weren’t going to plan. A 0-0 draw would’ve suited Arsenal just fine. Meanwhile, they were frustrated in the attack, with Arsenal’s back line holding pat and keeping Martin Chivers and Alan Gilzean on ice. Spurs needed a win to save face and thwart their rivals, and deep in the second half it didn’t seem like they had a path to do that. And then, with three minutes to go, disaster struck. Ray Kennedy, leading goalscorer for both Arsenal and the division that season, rose to meet a chipped ball from George Armstrong and headed home for a very late 0-1 lead. Tottenham scrambled to find a goal before full-time but they couldn’t break through. The whistle blew and Arsenal welcomed the away supporters onto the pitch to celebrate their newly-won First Division title. Spurs fans, needless to say, were dejected. Arsenal lifting the FA Cup less than a week later to complete the double just poured salt in the wound. That’s the tricky thing about playing for spite— the humiliation from failure can be worse than just losing a trophy. The next edition of the North London Derby kicks off early on Sunday at the Emirates. No league titles are on the line (yet), but Arsenal are in a three-way tie for first place and Tottenham are just three points behind. A win would put Spurs right in the middle of an increasingly-crowded title fight. Not that either side needed more motivation, of course. Kickoff is at 7am Eastern on NBC Sports Network.